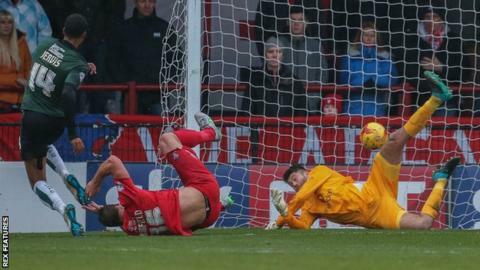 Jackie McNamara's first League Two game in charge of York ended in defeat at the hands of leaders Plymouth Argyle. The Pilgrims dominated the game, with Jake Jervis heading in Graham Carey's cross for the first after the pair both had earlier efforts saved. The impressive Carey fired in the second from Gregg Wylde's cross. Carey hit the bar with a cross in the second half before Ben Godfrey got a consolation goal in the eighth minute of stoppage time. There were 10 additional minutes after York's Dave Winfield was stretchered off midway through the second half with his neck in a brace after a clash of heads with Argyle defender Peter Hartley. The win maintained Plymouth's five-point lead at the top of League Two, while York's defeat left them two points clear of the relegation places. "I was more pleased with the second half. First half, I thought there was far too much fear in their game. "We weren't taking responsibility, we weren't on the ball and passing it to others when it's on in the last third. "So we changed things, brought on our 36-year-old (Jonathan Greening) at half-time to take responsibility on the ball and help others and I thought he did that. "He steadied us down a little bit." Match ends, York City 1, Plymouth Argyle 2. Second Half ends, York City 1, Plymouth Argyle 2. Foul by Jonathan Greening (York City). Lee Cox (Plymouth Argyle) wins a free kick in the attacking half. Goal! York City 1, Plymouth Argyle 2. Ben Godfrey (York City) right footed shot from the centre of the box to the top right corner. Assisted by David Tutonda. David Tutonda (York City) wins a free kick in the defensive half. Foul by Lee Cox (Plymouth Argyle). Hand ball by Graham Carey (Plymouth Argyle). Corner, York City. Conceded by Peter Hartley. Substitution, Plymouth Argyle. Lee Cox replaces Gregg Wylde. Attempt blocked. Michael Coulson (York City) left footed shot from outside the box is blocked. Corner, York City. Conceded by Gary Sawyer. Corner, Plymouth Argyle. Conceded by Eddie Nolan. Attempt missed. Jake Jervis (Plymouth Argyle) right footed shot from outside the box is close, but misses the top right corner. Attempt saved. David Tutonda (York City) left footed shot from outside the box is saved in the bottom right corner. Attempt saved. Ben Godfrey (York City) header from the centre of the box is saved in the centre of the goal. Substitution, Plymouth Argyle. Josh Simpson replaces Carl McHugh. Attempt missed. Jonathan Greening (York City) left footed shot from outside the box is just a bit too high. Attempt missed. Ben Godfrey (York City) right footed shot from the right side of the box is close, but misses the top right corner. Substitution, York City. Keith Lowe replaces Dave Winfield because of an injury. Delay in match Dave Winfield (York City) because of an injury. Corner, Plymouth Argyle. Conceded by George Swan. Corner, York City. Conceded by James Bittner. Corner, York City. Conceded by Kelvin Mellor. Attempt missed. Jake Jervis (Plymouth Argyle) right footed shot from the left side of the box is close, but misses the top left corner. Is this the longest wait in football?